From Drake pairing up with gaming personality Tyler “Ninja” Blevins for epic games of Fortnite, to Universal Music launching an official “Gaming Hip-Hop Playlist” with e-sports organization Luminosity, to Grand Theft Auto licensing hundreds of tracks across hip-hop, rock, pop, country and reggae over the last 15 years for its in-game radio stations, music’s role in video games and in the wider gaming community has a rich and valuable history. It makes perfect sense that Twitch, one of the leading video game live-streaming platforms in the world, is increasingly investing in its in-house music strategy. The Amazon-owned company has ambitions to become what Billboard recently described as “the music industry’s next new partnered revenue stream, promotional tool and talent scout”—similar to how platforms like Instagram and Vine have become indispensable A&R tools and revenue drivers for artists and labels. Twitch’s core product is like a combination of Facebook Live and Reddit AMA, featuring live video streaming alongside chat rooms where viewers can interact with each other as well as with broadcasters in real time. The site boasts 15 million daily active users, each of whom spends an average of 95 minutes on the platform every single day. There is a significant demographic skew: 81.5% of its users are male, while 55% of its users are aged 18 to 34. A selective group of Twitch users—27,000 of them, or just over 1% of the daily active user base—are official Twitch Partners. Partners can monetize their video content with ads and offer their followers monthly channel subscriptions for $4.99 each, in exchange for perks like unrestricted access to video archives, subscriber-only chat rooms and custom badges and emoticons. Any user can apply to the Partner Program, but those with a regular broadcast schedule of at least three times a week and an “established and steadily growing audience,” in Twitch’s own words, have the best chance of getting accepted. Building a large following on Twitch is, in short, labor-intensive. The most successful Twitch creators broadcast on a regular, reliable schedule, not unlike hosts on a radio or TV show. Twitch also emphasizes the importance of engaging with one’s follower community “off-stream”—whether in-person at meetups and events like TwitchCon, or on adjacent social-media and streaming platforms, especially those like YouTube and Twitter that also have strong gaming audiences. Music is one of Twitch’s official community categories, with its own designated page. Some of the most popular music channels are simply 24/7 livestreams, such as Monstercat 24/7 Radio (run by EDM label Monstercat) and RelaxBeats (analogous to the 24/7 lo-fi hip-hop channels on YouTube). A handful of musicians have also become full-time Twitch streamers. One of the most popular music accounts is a_couple_streams, run by husband-and-wife singer-songwriter duo Aeseaes. They maintain a regular streaming schedule, broadcasting every other day of the week and performing a mix of covers and original songs to as many as 400 people on an average weekday evening. 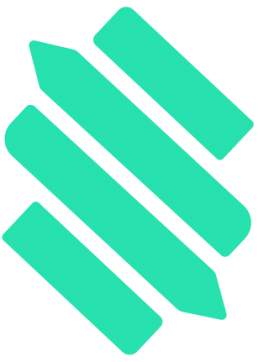 Their channel is popular in part because the experience is highly interactive: viewers can request songs in real time via StreamerSonglist, which integrates directly with Twitch. Most importantly, Aeseaes actively points their Twitch follower community to resources outside the immediate Twitch channel to drive streams and revenue. These include a smart-URL link to their latest EP on all streaming platforms, as well as their Patreon account, where they post exclusive content every month. 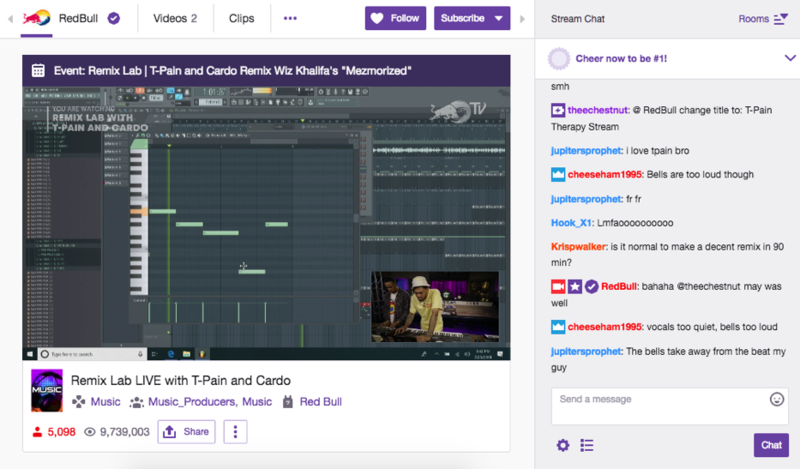 Many brands also run their own channels on Twitch, and are beginning to broadcast more shows around music. 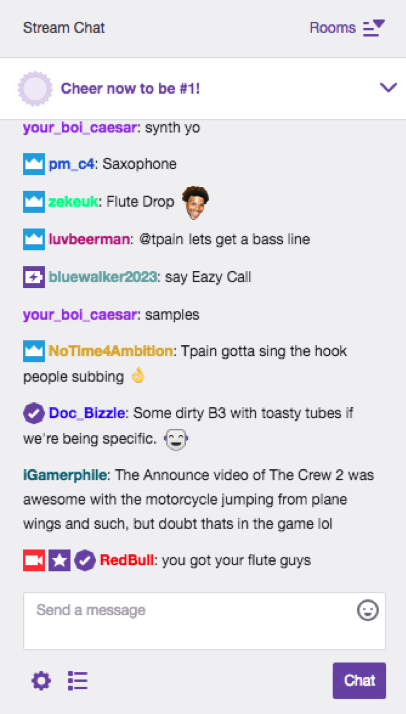 One notable example is Red Bull Remix Lab, a new show on Red Bull’s Twitch channel in which rapper T-Pain invites producers to remix popular songs in real time, incorporating live feedback and ideas from their chat room. In the most recent episode, T-Pain invited producer Cardo—who has made beats for the likes of Travis Scott, Migos and Kendrick Lamar—to live-remix Wiz Khalifa’s “Mezmorized” at Red Bull Music Studio in Santa Monica, CA. To keep the energy alive while Cardo was hard at work, T-Pain also asked the producer more personal questions about how he got into his profession, and how long it normally takes him to put together a remix (the answer: three to four hours on average, but sometimes an entire day). The stream had over 5,000 users watching simultaneously at any given time. The biggest takeaway from these examples is that there is no one genre for “Twitch music” or “gaming music.” Hip-hop, rock, electronic and folk artists alike are thriving on the platform and taking innovative approaches to building new audiences and revenue streams. Any artist can thrive on Twitch, as long as they have the right, platform-tailored strategy in place. Digital music licensing often seems like a cost-prohibitive, unsolvable maze of contracts and restrictions, especially for video. 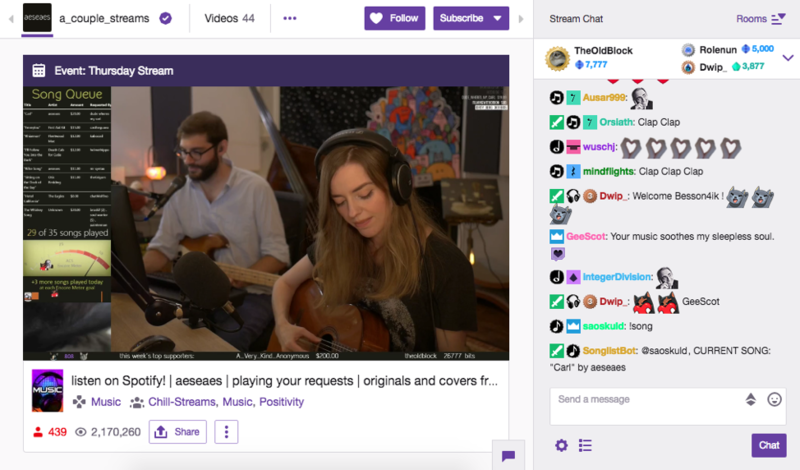 Even Twitch had a rocky start in the music licensing world, but now has friendlier options in place for its livestreamers—and are inviting all artists and labels to get on board. Back in 2014, Twitch announced that it would be using technology from Audible Magic to take down archived videos with infringing music content in the background, including in-game and ambient music. While the policy doesn’t apply to live-streams (i.e. there would be no automated scanning or takedown of live-streamed content, only of on-demand archives), it still impacts many popular accounts on the platform, even today. This June, the IFPI muted at least a dozen popular Twitch channels for 24 hours due to playing copyrighted music in their streams without permission. 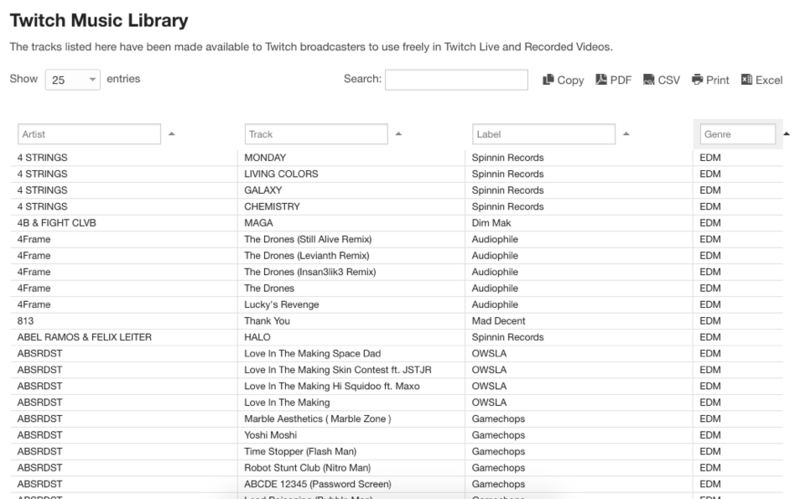 As an alternative, Twitch launched the Twitch Music Library in 2015, assembling a catalog of royalty-free music that streamers can play in the background without any risks of takedowns. Several prominent labels across multiple genres, including but not limited to Spinnin’ Records, Rhymesayers, OWSLA, Dim Mak, Ninja Tune and Fool’s Gold, are featured in the library. Any artist, label or other rights owner with at least 250,000 subscribers or followers on YouTube, Facebook and/or Twitter can submit their music to be included in the Twitch catalog via this open form. Twitch also maintains a Spotify profile with playlists of pre-cleared tracks for background use. Beyond Twitch, there are also many third-party resources that video-streamers can access for royalty-free music, including but not limited to Pretzel Rocks, Jamendo and the Free Music Archive. That said, it’s still against Twitch’s policy for users to broadcast house DJ sets, live covers or even karaoke parties unless they have the necessary rights from each of the respective copyright owners to do so. Even streaming music in the background straight from Spotify or SoundCloud can lead to your channel getting muted if you haven’t secured the proper rights beforehand. SO, HOW CAN ARTISTS MAKE MONEY? One big question that remains for artists and labels: if the only way you can stream music legally on Twitch today is by making it “royalty-free” or by making broadcasters pay more licensing fees, where is the revenue potential? 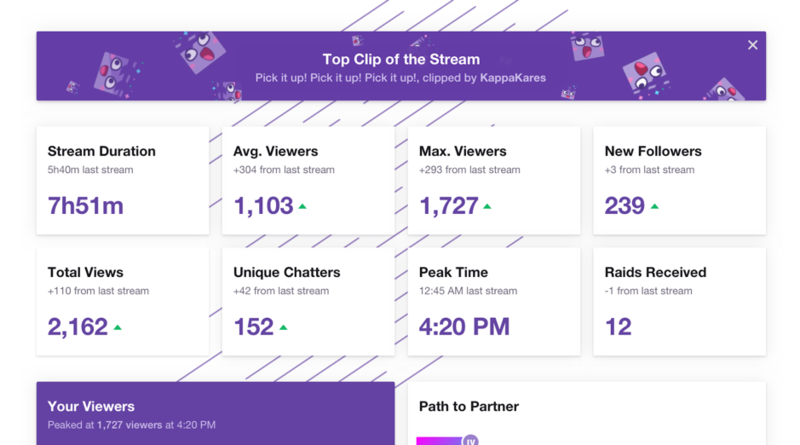 Part of the secret sauce lies in Twitch’s analytics dashboards for live-streamers, which include Stream Summary and Channel Analytics. Stream Summary gives details about number of unique viewers and chatters, as well as top sources of views both within Twitch (Following page, Browse page, Front page) and outside of Twitch (Twitter, Reddit, Facebook). Channel Analytics display details such as sources of revenue (paid subscriptions, ads, fan donations, etc.) and even which other Twitch channels share the most viewer overlap. Such data points can be invaluable for securing brand sponsorships, and for cross-checking data with that from other distributors such as Stem. And remember: some of the most successful artists on Twitch, such as Aeseaes, proactively direct their followers to other off-platform income sources such as Spotify, Apple Music, YouTube and Patreon, so as to keep their revenue as diverse and sustainable as possible.